Southside Rangers finished a crediatble fourth position in the South Belfast Youth League after losing 4-2 to third-placed Rosario in the final game on Saturday. 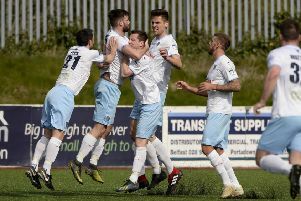 With Southside missing ever-present goalkeeper Stuart Wylie, they knew it was going to be a tough task but Connor Pogue almost gave the Ballymena boys the lead when he headed against the post. The deadlock was broken on 33 minutes when a Rosario striker evaded three tackles on the left edge of the penalty area before crossing low to present the incoming midfield player a simple tap in. The second half saw several changes to the Southside line up but Rosario struck early into the half making it 2-0. More misery followed when stand in keeper Lewis Erwin following a collision which led to that goal was forced to leave the pitch to be replaced by Ross Swan between the posts. On 55 minutes, goal machine Sam McNiece kept his team in the game when he headed home from a Josh McCready corner. Ross Swan saved brilliantly on two occassions before he was finally beaten from a free kick making it 3-1 and again the home side exploited the rookie keeper and went 4-1 up from distance. Again the Southside team refused to collapse and Corey McDowell, like his strike partner Sam McNiece earlier got his reward for his hard work when he scored a delightful goal lobbing the ball over the advancing Roasrio keeper from 30 yards. So the curtain comes down on Southside’ season with a respectable fourth place league finish in what was a transitional season following the exodus of players this time last term. Interesting days to come as the club now look to strenghten in preparation for the next challenge that lies ahead. Southside: Erwin, Kirk, Livingstone, McCready, Pogue, Graham, Wilson, Williams, McDowell, McNiece, Hamill, Swan, R Stewart, J Stewart, Wallace, Corrigan, Allen.